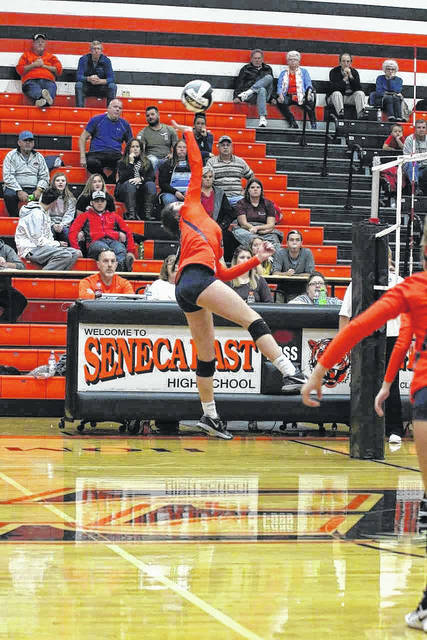 ATTICA — Galion’s impressive volleyball season ended Wednesday in a four-set loss to Crestview in a Division III district semifinal at Seneca East High School. With an original start time set for 8 p.m., the Tigers and the Cougars found themselves waiting to clash as the first semifinal match between Western Reserve and the Huron went five sets, with Huron winning. Galion lost 12-25, 25-22, 24-26 and 24-26 to end their season with 17-7. The Tiger ladies got off to a rocky start Wednesday. Crestview started with an ace on the first serve of the match. After Marisa Gwinner slammed down her first of 16 kills, the Cougars went on 10-0 run. Crestview dominated the opening set, using their height at the net and skilled serving to stretch the lead to 21-9 and eventually to the set-deciding score of 25-12. The second set showcased a Lady Tigers team that appeared to be non-existent in the opening frame. The Cougars started the set with a 1-0 lead, but Galion tied it up and would eventually take their first lead of the match at 2-1. Abby Foust add two aces to put the Tigers up 3-1 and that would begin the back-and-forth jostling that would define the second set. 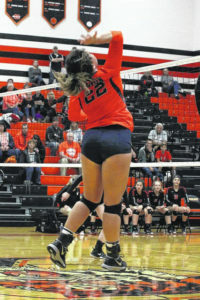 In a match that also featured aces from Kasidee Sinclair, Nicole Thomas and Jaden Ivy, the two teams would battle until Gwinner ended the second set with a tap over the net, giving Galion a 25-22 win.. In the third set, the Cougars clawed their way back and turned the momentum in their favor. As with the previous two sets, Crestview opened up with the first point before Galion tied it at one. Crestview proceeded to go on a 6-0 run to provide some breathing room and eventually run their lead to 11-4. 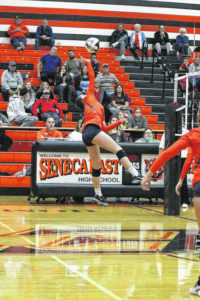 At this point, the back-and-forth would commence again as the two teams would trade points until a Lady Tigers’ rally knotted the game up at 14 apiece. But Crestview held on for the 26-24 win. For the first time on the evening, Galion went ahead 1-0 to open the fourth set. Galion kept the lead, until Crestview tied it 19-19. Galion would lose the lead for the first time in the set when Crestview pulled ahead 22-21. The two team exchanged leads, with Crestview pulling out the 26-24 win. With a lot of younger players seeing time on the varsity this year, Valentine is anticipating continued success in Galion’s future. 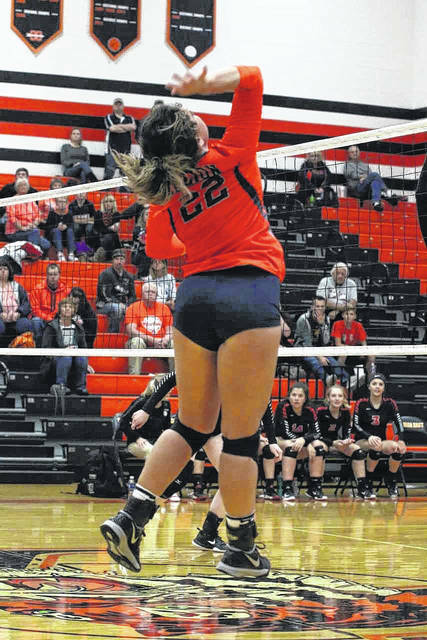 Serving statistics for Galion were: Team- 78/87, 33 points, 8 aces; Thomas- 20/20, 11 points, 2 aces; Ivy- 15/15, 7 points, 3 aces; Foust- 15/18, 6 points, 2 aces; Sinclair- 11/13, 6 points, ace; Kayla Hardy- 9/11, 2 points and Kate Schieber- 8/10, point. Offensive stats for the Lady Tigers were: Team- 122/146 attacking, 47 kills, 162/171 handling, 40 assists; Samantha Comer- 44/48 attacking, 17 kills, 2/2 handling; Gwinner- 31/40 attacking, 16 kills, 0/1 handling; Ivy- 24/29 attacking, 7 kills, 2/2 handling; Sinclair- 20/23 attacking, 7 kills, 2/3 handling; Gillian Miller- 0/2 attacking, 1/3 handling; Hardy- 2/3 attacking, 147/151 handling, 38 assists; Thomas- 1/1 attacking, 2/2 handling, assist; Foust- 4/5 handling, assist and Schieber- 2/2 handling. Statistics for the Galion defense were: Team- 70/75 reception, 6 solo blocks, 6 assisted blocks, 84/104 digs; Sinclair- 27/28 reception, 19 digs; Ivy- 26/28 reception, 1 assisted block, 25 digs; Thomas- 8/8 reception, 12 digs; Foust- 4/4 reception, 5 digs; Schieber- 6/7 reception, 7 digs; Gwinner- 0/1 reception, 4 solo blocks; Miller- solo block, 3 assisted blocks, dig; Comer- solo block, assisted block, 6 digs and Hardy- assisted block, 9 digs.